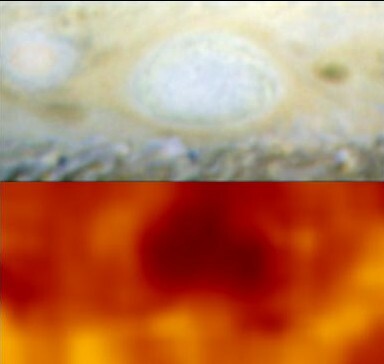 Explanation: Sometime in February, two of three long-lived Jovian storm systems known as "white ovals" apparently collided and merged -- forming what is now likely the second largest storm in the Solar System, after the famous Great Red Spot. 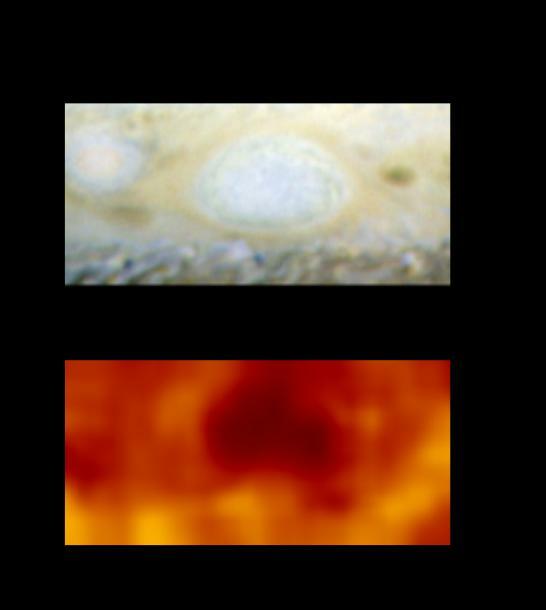 The whitish, oval-shaped storms in Jupiter's banded atmosphere have been telescopically studied since the 1930s, but details of this surprising merger are unknown as Jupiter and Earth were on opposite sides of the Sun when it happened. The aftermath is shown in the (top panel) Hubble Space Telescope picture, taken in July as part of the evidence investigators are using to reconstruct the facts of the case. Centered are the swirling white clouds of the newly created storm system which is about as wide as planet Earth. At its left is the remaining smaller white oval which seems to be drifting away from the larger new storm. Atmospheric temperature data from the Galileo spacecraft represented in the (bottom panel) false-color image show the new storm as a dark feature, cooler than its surroundings.